Many of our prospective luxury home and remodeling clients have the same or similar questions about our services. Below are answers to some of their most common questions about custom home building. Yes, we absolutely do remodeling work! We are well-known in the area as one of the best custom home builders around, but much of our business is actually remodeling work. 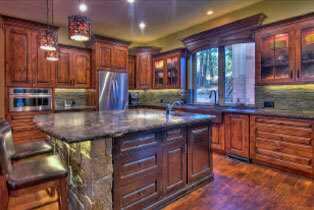 We can handle any type of remodeling project including kitchens, bathrooms, or additions. As with our building work, for a remodeling project we make sure to incorporate energy-efficient elements wherever possible, such as lighting and materials. How much does it cost to build a custom home? The answer to that question varies tremendously based on many different factors. Elements like the number of stories in a home, the amount of decking, number of garages, number of bathrooms, and many other things determine the cost of a custom home. Also, the location and geography have an effect on cost. If you are building in an area that has a very restrictive homeowner’s association, or are building a home on an upward or downward-sloping property, that will drive up the cost. How long will my custom home build or remodeling project take? A custom home build usually takes 6-9 months to complete. The time varies based on the location, size and complexity of the design, and size of the lot. A remodeling project can take anywhere from two weeks (typical for a bathroom) to 6-8 weeks (typical for a kitchen). If an addition is involved in a remodeling project, it really depends on the size and complexity of the addition. Is it hard to get a construction loan for a luxury home? No, it is not hard to get a construction loan, but it does require that you go through an extensive budgeting and planning process before applying for the loan. We help you through that process as a matter of course when you work with us on your custom home build. All things considered, getting a construction loan is no more difficult than getting a loan to purchase an existing home. Can I visit my custom home during construction? Absolutely yes! We encourage frequent visits from our clients, and can even arrange for weekly walk-throughs if that is desired. We want to keep you informed about what has been accomplished in your build so far, and what is coming up next, so you always know how the project is coming along. What if I change my mind about a certain aspect of the project while construction of my custom home is going on? Changes can certainly be made during the construction process, but depending on the nature of the change, it may cause added expense or delays. In general, things like moving the position of a window are not a problem. However, when it comes to moving a load-bearing wall or changing the size of the home, it will be more complicated. Also, the difficulty of making a change depends on how far along the project is. For example, changing the type of finish at the last minute would add more to the cost of the project than making that change early on. That being said, our clients routinely request changes during the building process, so we are used to working them to make sure that they are satisfied with the finished home. How do we start the process of building a custom home? When building a custom home or starting a remodeling project, the first ideal step is to interview and select a builder as an important member of the team. Although not critical, this is best before engaging with an architect and design team to start laying out a concept and specific plans. Having your builder on your team, reviewing plans and preliminary designs with a keen focus on cost controls and value engineering selections can make the design process efficient and effective, while avoiding future delays and/or costly design rework. One thing that is important to understand is that we are not a cookie-cutter home builder. Many home builders will replicate the core design of their homes over and over again, making only minor changes each time. This helps to keep costs down to a certain extent, but the result is a lot of “custom” homes that look almost exactly the same. We, on the other hand, build our luxury homes for our client’s unique tastes using unique design elements for the area that they live in. You can rest assured that if you work with us, your home will truly be one-of-a-kind. The ESI project team did a great job on the renovation to our home. The new kitchen, granite countertops, open design changes, and wood flooring all look great – and best of all, the project was completed just in time for us to move in. From the beginning, David Sipes (President, ESI Builders) was focused on building an energy efficient home. Our development included the use of integrated tile photovoltaic cells, solar water for the pool, a tank-less water heater with recirculating water for instant hot water on demand, radiant barrier insulation, adjusted low U value windows based on sun exposure, and high R-Value insulation. Great features to make our home sustainable! The additional cost of the state of the art energy-saving features ESI implemented in our new home was offset significantly by rebates and tax credits that Dave passed directly to us. With this complete combination we sacrificed nothing in the amenities of our custom luxury home, and we have run net negative electricity bills since moving in. Dave was in the field nearly every morning, pipelining tasks efficiently and supervising a tight timeline in a very hands-on way. We were impressed by his problem-solving ability and engineering acumen, while at the same time others involved in the process and even passers-by complimented us on both his courtesy and his professional skill. We would recommend you consider Dave Sipes and his team, without hesitation and would be more than happy to speak with anyone about our experience! We would also invite you to take a look at our custom home in Rocklin as the strongest testament to their work! We especially like the transparent cost breakdown of fees and charges. ESI works off of a flat builder’s fee so that each time we make a change request the builder fees will remain the same. Dave said that he should not expect to make extra fees just because we chose more expensive finishes, appliance, hardware, etc. What a great concept and way to build trust! I cannot commend ESI Builders enough for the quality construction and finishes of our large home remodel project in South Lake Tahoe. The quality of workmanship, product selection, and the top-notch subcontractor team created a living space and luxury that is incredible! I would highly recommend ESI for any project! My husband and I are very pleased with the quality and energy efficiency of the 1,000 square foot home addition completed by Dave Sipes and ESI Builders last year. From the initial project start through completion, the ESI team was transparent about the schedule, our costs, and any issues or problems – best yet, they delivered on every commitment. Visitors to our home rave about the transformation and quality of our new living spaces and kitchen – we couldn’t be more pleased! The energy updating project we received from ESI Builders on our home was phenomenal! Not only has it helped with the comfort level but has helped with lowering our electric bills. Dave Sipes (ESI Builders) and his crew were very conscientious of our home and were meticulous with their clean up. I highly recommend them to anyone who is looking for exceptional work. Dave Sipes (ESI Builders) and his crew were very conscientious of our home and were meticulous with their clean up. I highly recommend them to anyone who is looking for exceptional work. The energy efficiency and other projects at our house such as installing a new hot water heater, door weather proofing, dry rot damage, and porch reconstruction work was completed in a timely and professional manner and the quality of work was outstanding. I would not hesitate to utilize ESI Builders in the future. Plain and simple, Dave Sipes at ESI Builders is a top notch contractor. He is knowledgeable and stays on top of projects. We can’t recommend him more. My wife and I chose Dave Sipes and ESI Builders & Remodelers to construct our new home in Serrano because Dave immediately made us feel completely comfortable about the process. During our new Custom Home Project, Dave Sipes thoroughly reviewed the process that ESI goes through with us to make sure that our expectations were met and exceeded by the end of the process. Another bonus was the fantastic team that ESI put into place. For example, Dave Sipes suggested Miles Ostermann who worked with us to design the home and Diane Nicholas who has helped with the rest of the design details. We would highly recommend Dave Sipes and ESI Builders.